The NanoStudio app crams all the power of a production studio into your tiny little iPhone, iPod Touch and iPad. Created by Blip Interactive, NanoStudio offers almost all the major features of a professional digital audio workstation (DAW). Creating a full powered DAW on an iPhone would be absolutely impossible, but NanoStudio gets impressively close (much closer than I’d have guessed possible). The main screens are the mixer, instrument slots, sequencer, synthesizer, and pads. NanoStudio’s Eden Synthesizer is capable of creating some impressive sounds. It comes equipped with 4 LFO’s, dual X/Y controllers, pitch bend, and accelerometer. It can synthesize its own audio or you can load a sample onto it to tweak and edit for yourself. Multiple synths can be used simultaneously, and eventually you can sample Eden’s audio output onto a pad to free up processor power. 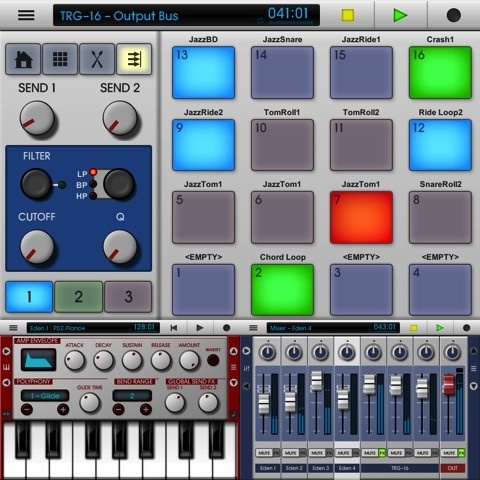 You can import samples to fool around with or use the built-in mic (except in the case of an iTouch, which needs an external mic) to record your own samples and edit them with custom effects as well. All samples can be arranged and triggered using the TRG-16 pad instrument, which comes complete with effect sends and filter setup. There are a number of effects including reverb, compressor, parametric EQ, waveshaper, delay, chorus and bitcrusher which have been designed to minimize processing demand. This allows for the possibility of many layers of effects to experiment with. The sequencer makes good use of the screen space. It is relatively simple and feels very manageable for anyone who’s been around a digital audio workstation before. Zooming in and out,cutting and editing clips, and drawing on the piano roller are all easy to be controlled on the touch screen. Mixing and mastering is also easy to handle, and once you’re ready to share your work you can upload directly to SoundCloud or save a .wav file to your computer. NanoStudio is definitely the type of program that benefits tremendously from the extra screen space of an iPad (more just a characteristic of sequencers as opposed to a shortcoming by developers). Regardless NanoStudio is still totally navigable with an iPhone. Newbies beware: I wouldn’t be quick to recommend NanoStudio to anyone who hasn’t had their hands around a DAW before, but it makes for a great portable studio to anyone with an interest and knowledge of music production. It costs $14.99, which in the world of apps is quite a bit, but if you enjoy music production then you’re guaranteed to get more than your money’s worth. AppSafari review of NanoStudio was written by Neema Akhtar on April 23rd, 2012 and categorized under App Store, Featured, iPad apps, Music, Productivity, Universal, Utilities. Page viewed 4444 times, 5 so far today. Need help on using these apps? Please read the Help Page.